We never usually give the maximum of stars in a review as they say nothing is perfect. 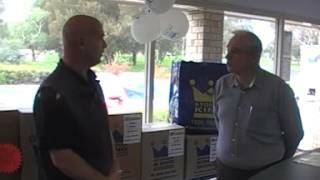 Storage King Kambah are perfect it in every way! They are compassionate, understanding to any concern or situation. Having your belongings in storage for what ever the reason may be, is stressful and worrying as well as an incurred expense. It proves to communicate to with them no matter what the problem or issue may be, they will help where possible. THANK YOU for all of the support and understanding Adam, will highly recommend Storage King Kambah ALWAYS. Hello Capitol, We're always happy to hear good things from our customers. Sounds amazing!!! My friend signed up this week with storage king kambah. The prices were great and the customer service from both Sommer & Scotty was exceptional. Thank you for your friendly service, I would definitely recommend to anyone looking for storage. Parcel King. What a wonderful service offered. My boxes were picked up from home, secured and labelled with the help of staff and they are now on there way to their destination. Everybody needs to know about this great service!!! Delivery expected within days interstate. Can’t thank you enough Adam. My online order was ready for pick up within hours of processing with the option of delivery within 24 hours. Super fast and responsive service. Friendly staff and service. Moving in and out easy with storage you can drive right up to. Hi John thanks for your positive review. We're glad we helped make your move easy! Hi Chris for your positive feedback! Storage King Kambah is in a league of its own, thanks to Adam. When relocating or moving it’s stressful enough. With the help and assistance from Adam and the Staff, it makes the move just that little easier and stress free. A big THANK YOU from Capitol Works. Thank you to Adam and the team at Storage King Kambah. Professional and customer focused, they really go above and beyond to ensure you have the right level of storage to meet your requirements. I spent quite a bit of time researching different storage outlets before choosing Storage King Kambah. Each and every time, Adam would answer all my questions, nothing was too much trouble. Thanks Adam, you are a credit to your organisation. 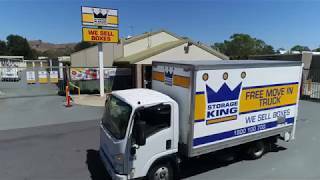 We had a fantastic experience with Storage King Kambah. The staff have been extremely helpful and pleasant to deal with and the storage facility was excellent for our needs. We were lucky enough to use the courtesy truck to move out which made moving day very easy. Highly recommend! Mark was really helpful and informative with us on arrival. Very professional. Gave us a great deal on a storage unit perfect for our needs. The area is very clean and tidy and easy to navigate. Appears very secure. A massive bonus is that we can use trailers free of charge for the whole time we use the unit. We highly recommend storage king! Friendly and helpful staff, good products. Will definitely be a return customer. I am the President of the Tuggeranong Lions Junior Australian Rules Football Club and am aware that a number of our children's parents use this facility. The feedback I have received in relation to the services provided is fantastic. On a personal note, we have shopped at Storage King Kambah for boxes and have family members that have used this facility for long term storage while overseas. I would recommend this organisation to everyone who is after storage requirements. Had a need for short term storage and Storage King provided me with what I wanted at short notice and at a good price. Had a misunderstanding over the monthly billing arrangements, and they graciously resolved for me. Will use them again. The Kambah Storage King staff have been really wonderful - we have had several changes of plan about clearing out dates, due to various family crises, and they were completely helpful and adaptable. Ran into some trouble moving into our new place in Canberra. I needed a place to store all our stuff for 2-3 days while the previous tenant finished moving out. The guys at Storage King were extremely helpful, and gave me a great deal. Could not recommen highly enough. Great facilities and helpful staff. They also offered the best deal on a longer term storage. Whole process was easy. Visited to get a written quote was shown the various options in their demo units. Went back a few days later and signed up, no problems there, price was honoured. 30 day auto renewing contract, 14 days notice required. Unit under cover, at no risk from the elements. key coded secure entry, wide pathways and roads to the units and unit clean and dry. Little more light would be appreciated but overall a very good experience. I've been using the storage facility in Kambah for about four years now. The lot is very secure, the staff are always helpful and access has never been a problem. Also I've found that the unit itself is very dry and well insulated. Storage King Kambah is one of Australasia's largest self-storage facilities. We can provide safe, secure and sensible storage solutions at an affordable price. If you need storage for home, business, documents or hobbies, look no further! With one call to Storage King Kambah, you will find your packing, transport and storage solutions. We have a huge range of unit sizes to accommodate your every need- from a small locker to a mini-warehouse. The friendly staff at Storage King Kambah will help you calculate the unit that best suits your needs; we will even come to you to appraise your home or business free of charge. Our state of the art facility is purpose built for self-storage, floor and insulated roofing.Storage King Kambah is constructed on one level, giving you easy, drive-up access, without climbing stairs or managing elevators. No need to break your back accessing your unit; simply drive to your site, unload using our trolleys, pallet jack or pedestrian forklift and the job is done! Storage King Kambah proudly services Oxley, Greenway, Monash, Gowrie, Wanniassa, Fadden, Gordon and Calwell.